"What is Literature?" remains the most significant critical landmark of French literature since World War II. Neither abstract nor abstruse, it is a brilliant, provocative performance by a writer more inspired than cautious. "What is Literature?" challenges anyone who writes as if literature could be extricated from history or society. But Sartre does more than indict. He offers a definitive statement about the phenomenology of reading, and he goes on to provide a dashing example of how to write a history of literature that takes ideology and institutions into account. This new edition of "What is Literature?" also collects three other crucial essays of Sartre's for the first time in a volume of his. 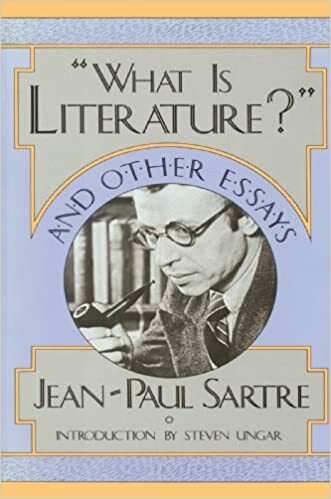 The essays presenting Sartre's monthly, Les Temps modernes, and on the peculiarly French manner of nationalizing literature do much to create a context for Sartre's treatise. "Black Orpheus" has been for many years a key text for the study of black and third-world literatures.